Fiction Author T.W. Colvin: This is How I Write! This is How I Write! When it’s time to write, I hide away in my own little world…a magical place that gives life to words. And it doesn’t hurt that the doors to my office have very durable locks, making it the best place for me to write in my busy home. 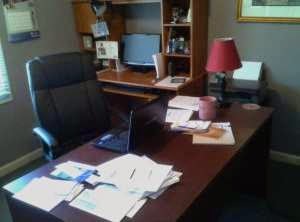 Knowing that this space is just for me allows me to be an “impassioned author”, without interruption. And when it came to furnishing my little haven, I decided on a comfy high back chair, since I would be spending a lot of time in it (not to mention that it made me feel like I was in control). I also needed a computer desk for my desktop PC as well as an actual desk. This combination would provide a little nook for me to work in and afford lots of space for organizing my notes and conducting other tasks. Every time I go into my office to write it’s like a writers retreat. I can escape into a world that I am creating or just enjoy a little peace and quiet. And though I have noted several items that are needed in my writing process, I would be far less productive without my pre-writing notebooks AND my pink fuzzy writing socks! They are as important to me as Superman’s cape. 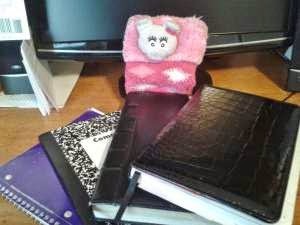 I often stash my notebooks in different places (purse, car, truck, work etc. ), just in case I am overcome by a need to record something before I forget. Then when I get to my office I can revisit those notes and get back on track or take my writing in an entirely new direction. And the socks, well, (Did I mention that they’re pink and fuzzy?) they are warm and comfortable and my own personal rendition of a “thinking cap”. This is a portion of the - Writers Space post originally published on No Wasted Ink.